When you think of electrical issues in a home, you probably don't think about phone chargers, toy chargers, camera battery chargers, etc., but you should. Most people don't even think to unplug their phone chargers when they remove their phone, but they should. Some phone chargers continue to draw electricity even when the phone is not attached . In this photo, you can see a camera charger that does the same thing. The absence of the battery does not mean the absence of electricity. This charger heated up, for whatever reason, and blew out the top of the unit just above the blades. I know the receptacle is new within the past few months. My client sent a note asking if this was a fire hazard. Yes, it is. 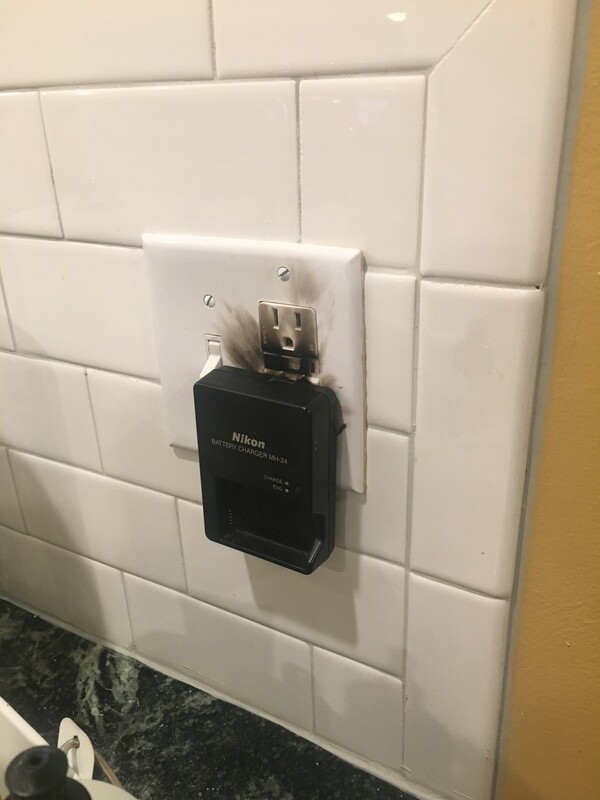 There is no way to know what caused this charger to burn up, but what if you were at work when it happened? What if you were on vacation or away from home for a few days? Always keep your charging devices unplugged when you are not using them, and only charge with them when you are home. It's such a simple thing, but it's so simple that most people wouldn't even think about them until something like this happens. Most devices perform just like they are designed to perform, but it only takes one with an internal flaw to change your life forever. Do the simple thing, unplug when not in use.